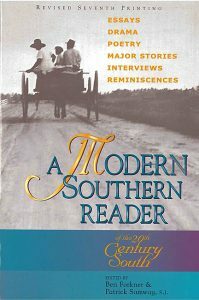 A Modern Southern Reader – Peachtree Publishing Company Inc. This volume is a comprehensive collection of the writing that has defined the modern South, from the Fugitives to the present. In A Modern Southern Reader, they bring together representative work of many writers who are not only the best of their region but who are also among the very best our country has produced. From the Fugitives who led the Southern Renaissance in the twenties through Faulkner and O’Connor up to such contemporary talents as Barry Hannah and Dave Smith, Forkner and Samway have assembled a collection that demonstrates the enormous depth and variety of modern Southern literature. This important and comprehensive collection of fiction, poetry, drama, essays, interviews, and reminiscences is a treat for all lovers of fine literature. It is also an invaluable addition to the libraries of students and scholars alike. Ben Forkner, PhD, is professor of English and American literature at the University of Angers in France. A graduate of Stetson University in Florida, he received his PhD from The University of North Carolina at Chapel Hill. He lives in France. Patrick Samway, S. J. received his BA and MA from Fordham University, his MDiv from Woodstock College, and his PhD from the University of North Carolina at Chapel Hill. Father Samway taught for eight years at Le Moyne College in Syracuse, New York, and also has received two Fulbright lectureships to France.